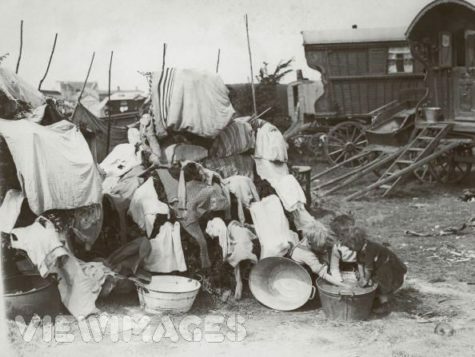 Children at a Gypsy encampment at Epsom help with the laundry chores the day before the Derby, circa 1935. 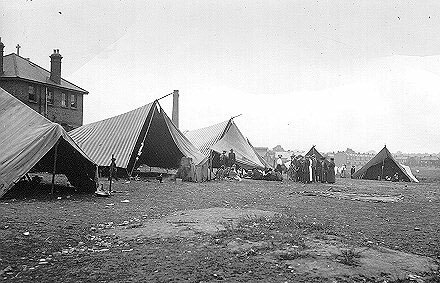 A makeshift tent in a gypsy encampment on Hurtwood Common Surrey, Jan 30, 1934. 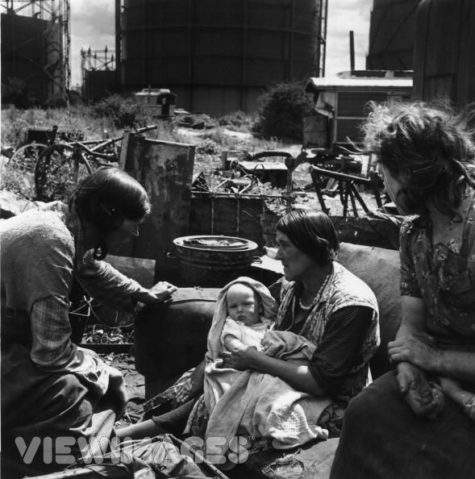 Gypsy women and a baby in an encampment overshadowed by gasometers and strewn with rubbish, July 28th, 1951. 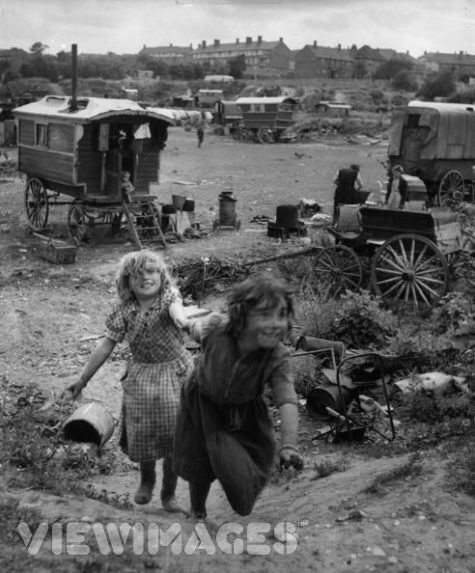 Gypsy children play in squalid and overcrowded encampment at Corkes Meadow Kent, July 28, 1951. 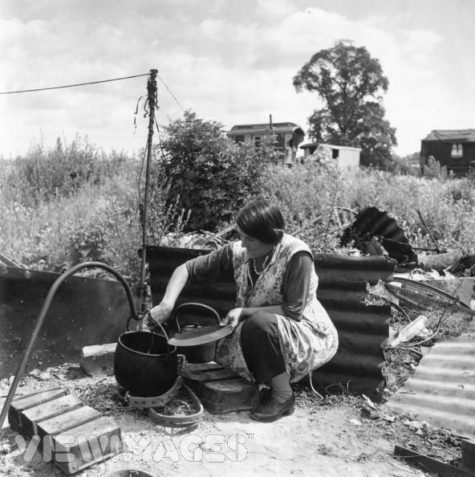 A Romany woman cooks dinner in an iron pot hung over an open fire at the Corkes Meadow encampment in Kent, July 1951. 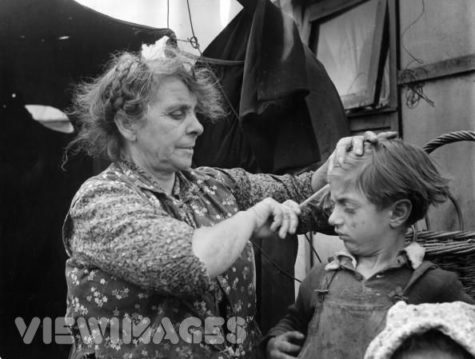 A Romany woman combing her sons matted hair outside her tent in an encampment on Corke’s Meadow Kent, July 1951. 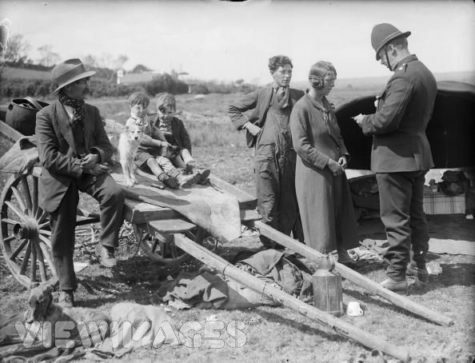 A policeman inspecting a license at a gypsy encampment on Kings Moor near Tenby, May 1935. 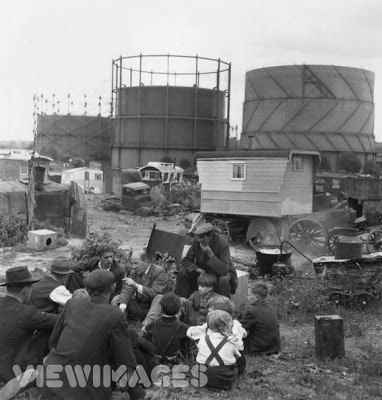 London missionary and friend of the gypsies William Larmour talks over problems with elders of tribe in the Corkes meadow encampment, overshadowed by gasometers and strewn with rubbish, July 1951. 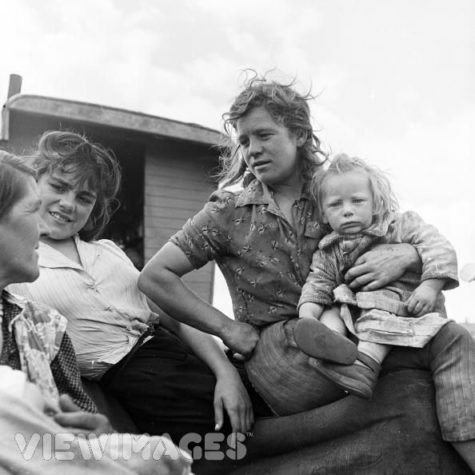 A Romany family on the steps of their caravan at the Corkes Meadow encampment in Kent, July 1951. 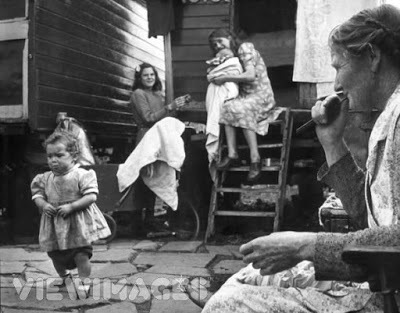 Mrs Robert Matthew, an MPs wife campaigning at a gypsy encampment, October 1951. 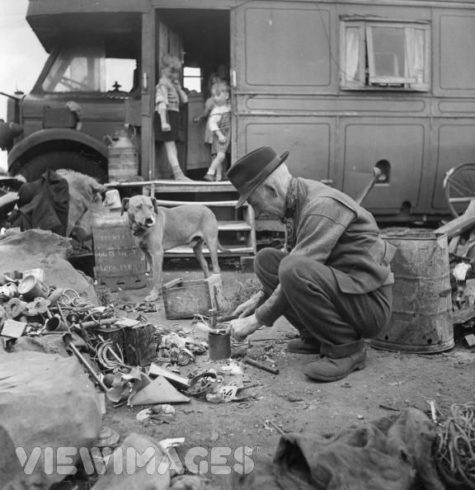 An old Romany turns his hand to the traditional Romany trade of tinkering (scrap metal dealing) at the Corke’s Meadow encampment in Kent, July 1951. 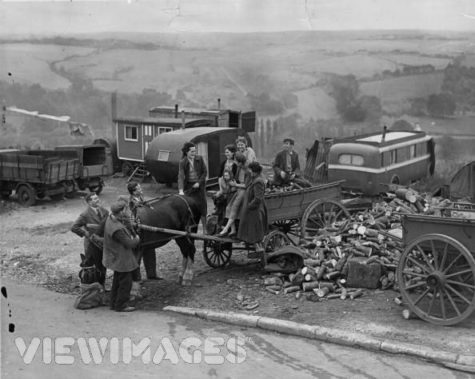 But it wasn’t all rubbish, squalor, and hard work. There was family, fun, freedom, and fresh air too. 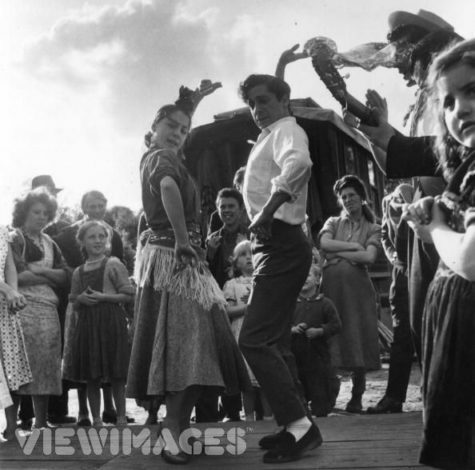 Famous Spanish dancer Antonio with some Brtitish gypsies, October 1956. 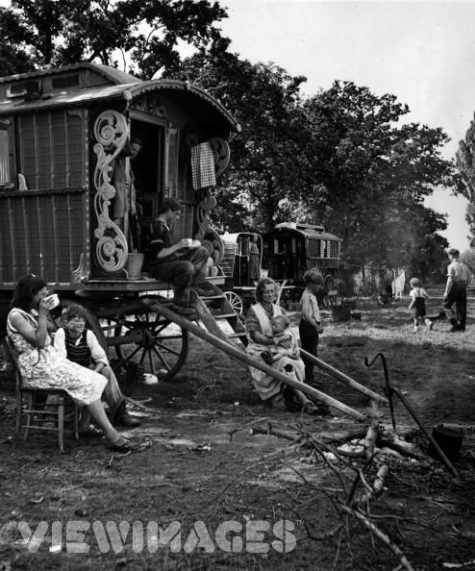 A family of gypsies sitting outside their caravan on an encampment at Brook Farm during the fruit picking season, September 1942. Father and son have a talk, July 1951. 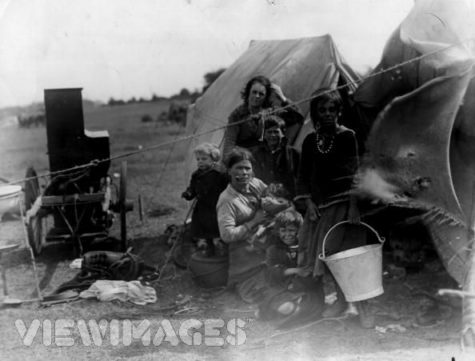 Grandmother Eyres keeps eye on the children whilst mother prepares supper on gypsy encampment in Surrey. 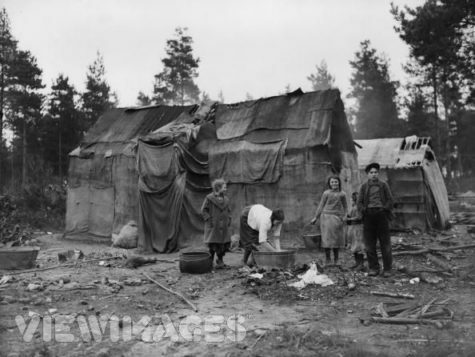 Despite their lifestyle, the Eyres family was a prosperous one, owning several plots of freehold land, circa 1946. 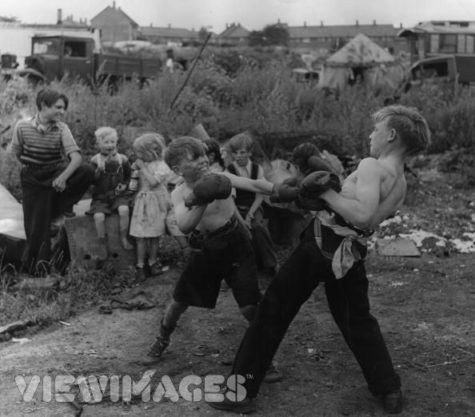 A boxing match in progress between two gypsy boys on the Corkes Meadow encampment in Kent, circa 1951. 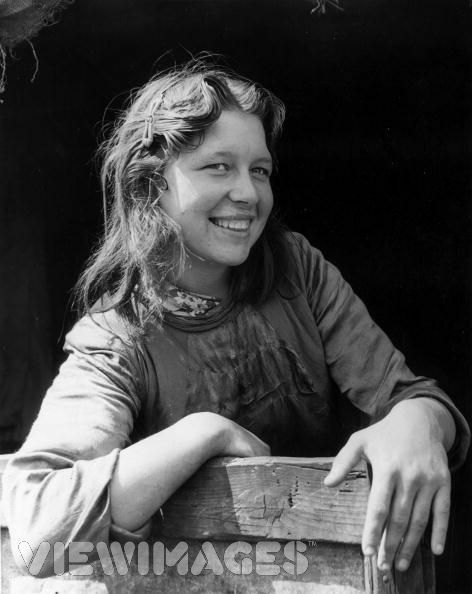 A young Romany woman in an encampment on Corkes Meadow, Kent, July 1951. Here’s a recipe for a delicious Yuletide holiday svaijko. 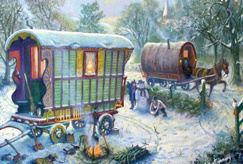 It is a freely adapted modern version of a very old, traditional Romany holiday recipe. Mix the yeast, butter, water sugar and flour in a bowl so that you get a firm dough. In another bowl, mix sour cream, sugar and raisins. Roll out the dough so that it is flattened, and spread the filling all over it. Shred the chocolate all over. Roll up the dough into a cylinder shaped roll – but carefully, so that the filling does not leak. 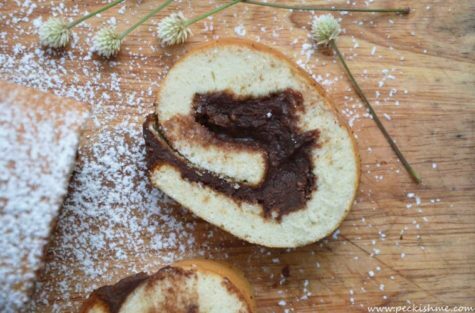 Brush the roll with butter, and spread some sugar all over it. Bake it in the oven at 200 degrees Celsius (390 degrees Fahrenheit) for about 40 minutes, until the roll is relatively firm inside. Slice the roll into appropriate pieces. Serve it as a snack after the Christmas dinner, and your Christmas feast will be a great success! If you need to convert the measurements there is a nifty calculator at Diana’s Desserts. You have met someone you desire. According to the Romanies this spell will ensure that he or she responds. First, gather a fresh rose and two red candles, and find out the time of sunrise the next morning. 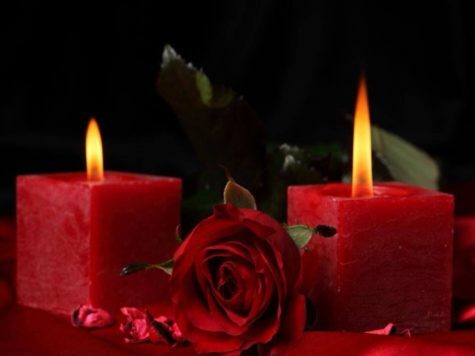 Just before you go to sleep, place a red candle on each side of the rose. This red rose is for true love. True love come to me. Now go back indoors and put the rose in its original position. Light the candles, and imagine love burning in the heart of the one you long for. Keep the candles lit day and night until the rose fades. (If they are extinguished, the incantation will be broken.) When the rose is dead, pinch out the candles, and bury the rose. 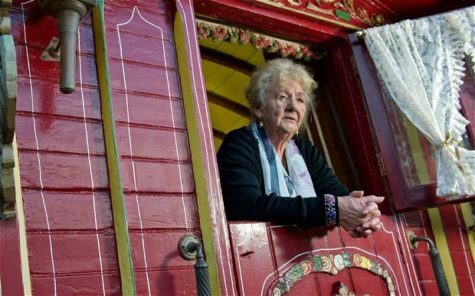 Although in Romany culture divorce is taboo, their marriages are not necessarily happier than most, and sometimes partners do go astray. But there is a spell that draws a partner home to his or her original ties. This spell is very basic, as down-to-earth as the Romanies themselves. It gets to the point and apparently works. Choose a pair of your partner’s underwear and a pair of your own. Take two nutmegs, and write your partner’s full name on one and your own on the other. Bind the two nutmegs with a red cord (to symbolize passion). Wrap them in the underwear, and place them in a clean white envelope. Sleep with them under your pillow if your partner is away, or embed them in a drawer where you keep your favorite or most sensual clothes. 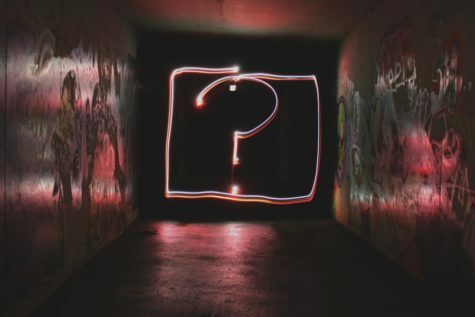 When an unwanted divorce appears likely, the Romanies advise the one who wants their partner to return to light a purple candle. Pierce it with a pin from right to left, so that the pin tip emerges on the left side of the candle. Then take a pin with a blue head and pierce the candle from left to right. As you do so, focus on the point of the pin, and the idea of crossing the other person’s path. Leave the candle to burn and extinguish itself. Afterward, bury the pins. 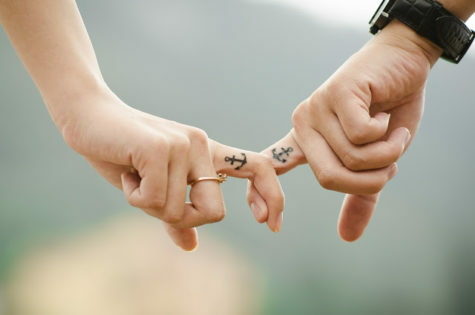 Divorce is taboo among the Romanies, so this spell is used to heal a broken marriage. It requires little more than an apple, true love, and the sheer determination to keep the marriage intact. The advantage of this spell is that a link is already been established. The marriage simply needs reinforcement or bridging. Buy a perfect-looking apple. If it is summer or autumn, pluck an apple yourself; an apple right off the tree has more life force in it. Cut the apple in half. Regard it as an auspicious omen if the seeds have not been severed with the knife, but don’t worry if they have. On a piece of clean, unused white paper write the woman’s full name. Next to it, write the man’s. Cut out the names, keeping the piece of paper they are on small enough to fit between the apple halves. Then place the paper with the names between the two halves and imagine the marriage being healed. Skewer the apple halves together with two pins, inserting the pins diagonally from right to left and from left to right. 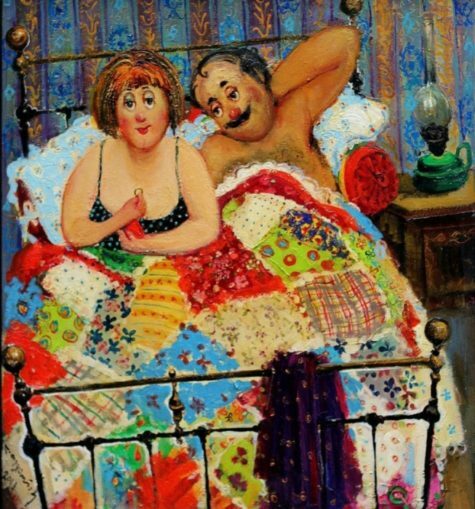 When you position the pins, send love to your partner and ask for the love to be reciprocated. Romanies use their campfire to bake the apple. You could place your apple in your hearth or in the oven instead, and bake until the apple appears whole. If you can get your partner to eat some of the cooked apple, so much the better. Whether or not you’re married, everyone will be happier if your partner’s mother loves you. You can win your mother-in-law over by sending your love to her. Take a pin with a blue head, for healing, or a yellow head for enlightenment. Between the beginning and end of your message, pierce the candle with the pin so that its tip emerges on the other side of the candle. Light the candle and imagine the light of the flame warming your mother-in-law’s heart. Leave the candle to burn down and extinguish itself, and salvage the pin. Now have a tulip bulb ready, because tulips are said to heal rifts and reunite. Confirm your wish as you push the pin into the bulb. Then bury the bulb in a plant pot or garden. If it is the wrong season for planting, plant the bulb in a flower pot and care for it indoors. Your mother-in-law’s love for you will grow with the bulb. Please (name of person), do think again. may the consequence heal my pain. The good in your heart set me free. Snuff the candles out after casting your spell. 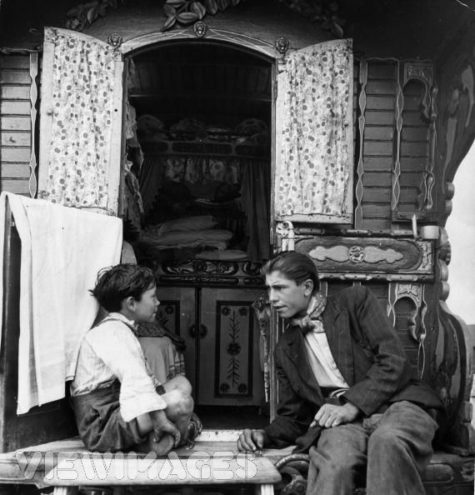 Many gypsies carry amulets and talismans as good luck charms. In gypsy lore an amulet is an item from nature that is either naturally, or artificially (through ritual), charged with magical power. A typical amulet would be a stone with a hole through it or a rabbit’s foot. 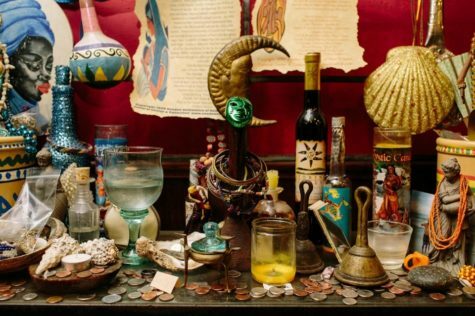 Talismans, on the other hand, are man made objects charged with magical power by the gypsy sorcerer. A typical talisman would be a piece of parchment or a coin, which has been inscribed with specific symbols, or words of power. Amulets and talismans are usually carried on the gypsy’s person in a cloth or leather pouch, known as a “putsi” or “parik-til”. You might see a gypsy woman wearing a putsi hanging from a cord around her neck. To the non-gypsy this looks like nothing more than an accessory to her colorful dress, but in fact it would likely contain amulets and talismans, and other magical items. There is no use buying or finding a good luck charm only to put it away and forget it. It should be kept close, in a purse or pocket, or worn around the neck, and it should be handled often, always with a feeling of happiness and hope. The greater the certainty that the charm will bring good luck, the more effective it will be. If you look at your charm or good luck piece with skepticism, thinking “How can this bring me luck? I am never lucky.” then, of course it won’t work – how can it? The charge will soon fade and die.